Hurricane Harvey Total Rainfall: The black dashed line is approximate area of 24 inch rainfall. the blue and red dots are rain fall reporting stations. In excess of 15,000 square miles received about two feet of rain or more. It was a 25,000-year storm. Its area of 24-inch rainfall was 50 to 100 times greater than anything previously recorded in the lower 48. Up to a million cars may have been flooded. In Harris County alone, 136,000 homes were flooded. Yet the official word from academia on Hurricane Harvey was that it “may have been enhanced” by climate change. When are we going start using professional judgement like doctors and engineers use to keep us safe, instead of the absolutes of certainty with science? Because of certainty in science, we cannot admit that Hurricane Harvey and other extraordinary weather extremes like Harvey were caused by climate change. Not only are we are exposing our culture to grave risk, but by not using professional judgement to make this call, we perpetuate climate pollution reform inaction that has solely created this great risk. “We can’t tell if this particular weather event was caused by climate change or not.” This is one of the most dangerous climate science statements in history. It comes from certainty in statistics and it defines how scientists speak of their findings. There will always be a chance that a weather event could have occurred in either our old climate or our new climate. Generally, if there is a 1 in 20 chance, or even a 1 in 10 chance that something is not 100% for sure, we get this dangerous quote from scientists. The concept is based on an event that happens five or ten percent of the time and is directly related to the terms from the Intergovernmental Panel on Climate Change (IPCC) of “extremely likely (5%)” and “very likely (10%)”. It is this “certainty” in science that is getting us into trouble. Harvey had a one in 25,000 chance of occurring in any given year–in our old climate. Therefore, Harvey should happen once every 25,000 years. Sorting this out with science takes time that we simple do not have. Regardless of the risks, science must adhere to principles of “certainty.” But doctors and engineers are not bound by certainty. Harvey, and Sandy, Ike, Charlie all those record breaking Pacific Cat 5 cyclones recently, these are not normal hurricanes. Though the science says they will get bigger and more extreme with warming, why don’t climate scientists just come out and say the obvious? Take Harvey for example. Those first reports of Harvey being a 1,000 year storm were obviously not correct. This is obvious to me, a hydrologist for 30 years. But everyone else must rely on what the media says. n this case, a very well credited sicentists atthe University of Wisconsin used the tools available to evaluate the worst 24 hour rainfall period of Harvey, that proved to be a 1,000-year storm, and then that went rogue. This 1,000-years storm represented an overnight “core dump” or rainfall. This is what a dying, land bound, stalled out hurricane does; it dumps all of its rain in the central core, at night. Houston saw three of these core dumps on three successive nights. But three 1,000-year storms ion three successive nights is not a 1,000-year storm. As we know now from the good work of the folks at Metstat, this entire event 120 hours of rain, was a 25,000-year storm. What doctors and engineers do to keep us safe is they use professional judgement. They take the certainty of science and apply it to life using risk to gauge whether or not action is demanded. If the uncertainty is high, but the risk is grave, say with cancer, or auto crash mortality, the decision is simple. Treat the risk as if it was a sure thing. If the risk is high enough with professional judgement, the event becomes certain enough for action to be taken. Do we wait and see if the projections of climate changes are scientifically certain before we act, or do we use professional judgement? 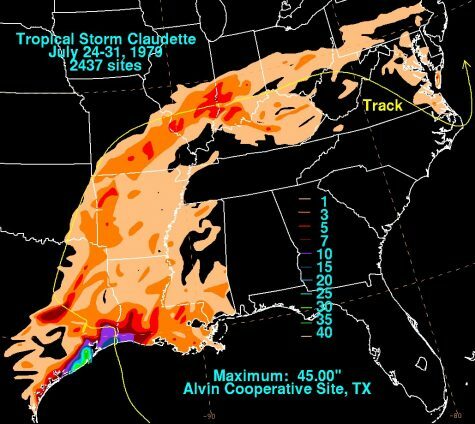 The U.S. Continental 24-hour rainfall record was set in Alvin in 1979 during tropical storm Claudette. Claudette’s rains of greater than 24 inches covered 400 to 500 square miles. David Roth, Weather Prediction Center, Camp Springs, Maryland National Oceanic and Atmospheric Administration, NOAA. A warmer atmosphere holds more water vapor. A warmer ocean has more energy for a storm’s development. Warmer water evaporates faster, putting even more moisture in the atmosphere. Deeper ocean warming now present in the Gulf of Mexico creates less cooling of the ocean surface from mixing caused by hurricane wind and waves, which allows more heat to be transferred to the atmosphere. And dynamics: dynamics are those processes like when we look into a pot of water on the stove and see convection, or warmer water rising from the bottom of the pot. As our average air temperature increases, rising air moves faster. When moist air rises, because the temperature falls with altitude, the moisture condenses into clouds. This condensation releases heat, which makes the air rise even faster, allowing more moisture to condense faster, releasing heat even faster. This is the hurricane heat engine. Climate change is like steroids for hurricanes. In other words, climate change is a nonlinear process. That is, a little warming does not create a little more hurricane, it creates a lot more, like a population explosion or an avalanche. Climate change is almost exclusively a nonlinear thing. A little warming puts a lot more energy in the weather. The most extreme Cat 4 and Cat 5 hurricanes have already been shown to be increasing in strength and numbers, and are expected to double in numbers by century’s end and total hurricane cumulative energy to increase by 20 percent–based on scientific certainty. The Intergovernmental Panel on Climate Change (IPCC) in their 2013 report says there has been, “a virtually certain increase in the frequency and intensity of the strongest tropical cyclones since the 1970s in that region [the Atlantic basin].” They are referring here to Cat 4 and Cat 5 storms. Amelia’s 24 inch rains covered 500 to 600 square miles. David Roth, Weather Prediction Center, Camp Springs, Maryland National Oceanic and Atmospheric Administration, NOAA. As of the 2013 IPCC report, Antarctica has now begun to lose ice (nearly as much as Greenland.) It was not because Antarctica suddenly began losing ice; the first publishing on Antarctic ice loss was in 1996. The reason is scientific certainty. We knew all along that Antarctica was losing ice, but the statistical certainty just wasn’t there. Like, we know the Russians were the ones that stole the ClimateGate emails. It is because of this certainty characteristic of science that virtually every climate impact we are seeing today is happening ahead of schedule: Arctic sea ice loss, Gulf Stream shutdown, beach erosion, polar subsea methane venting, high altitude and high latitude ecosystem collapse from insect attack, and the flip of Amazon from carbon sink to carbon source. All are happening decades to a century or more ahead of schedule, because scientific certainty could not say for sure that these things would happen as they have been happening, when these things were first published. The jet stream is a river of air flowing around the earth that is formed by the earth’s rotation. Embedded within the jet stream are waves similar to the “haystack” waves that form in river rapids. They are called Rossby waves in meteorology. These waves “pick up” the jet stream and the two interact with one another creating meanders that push cold fronts and weather systems around the planet. So literally, these meanders in the jet stream move our weather west to east across the planet, following the jet stream’s north/south meanders. Hadley Cells have expanded over Texas. Where the air in the Hadley Cells descends, steering currents are weak. Image from: COMET Program, a part of the University Corporation for Atmospheric Research’s (UCAR’s) Community Programs (UCP) and is sponsored by NOAA’s National Weather Service (NWS). For about ten years now, we have known that these Rossby waves slow when Earth warms. The slowing is caused by the difference in temperature between the tropics and the poles; this is called arctic amplification where the poles warm more than the rest of the planet. It is these Rossby waves that researchers headed by Michael Mann form Penn State, and including the German Academy of Sciences, University of Minnesota at Duluth, and the University of Amsterdam, have published about in a continuing line of diverse research findings from across the globe. These findings reveal observations of slowing and stalling of the jet stream’s march across the planet because of warming. This new work adds to the already established body of research and increases the “certainty” that events like hurricane Harvey were a product of climate change. The far advanced northern location of the jet stream too, a condition created by expansion of subtropical circulation cells (Hadley cells) is also a part of the puzzle. These Hadley cells exist on either side of the equator and wrap around earth like a giant jelly roll. They are caused by hot air rising in the tropics, flowing north in the upper atmosphere and descending somewhere at the boundary of the subtropics–right over Texas. The position of Hadley cells is part of what determines where the jet stream flows around the earth. With expanded Hadley cells, the jet stream sets up farther north. The farther north the jet stream is, the less likely steering currents will pick up a tropical system and move it along. Riechler summarized the available work on expansion of Hadley Cells as an indicator of climate change and showed a 1.4 degree increase northward in the northern edge of the Hadley Cells per decade since 1979. This “shift” is nearly 400 miles. Tropical Storm Allison in 2001 was the 17th most costly catastrophe in the U.S. produced 30 to 40 inches of rain and $11.9 billion in damages. The area of 24″ rainfall was about 600 square miles. The slowing and stalling of weather systems caused by all these things has been attributed to drought and flood in recent decades. Most notably, Hurricane Sandy’s infamous left turn into New York City and New Jersey was caused because of a stalled high pressure system over Greenland. The “left turn” made by Sandy had literally never occurred before, since records began being kept. The big Texas and Oklahoma drought in 2011 and the recent drought in California were all impacted by stalled Rossby waves. Stalls are not new to hurricanes, but five day stalls are pretty crazy. A normal stall is a day or maybe two. Longer stalls have happened and these are responsible for the heaviest rainfall totals we have recorded. Hurricanes generally though, tend to move along. So with normal hurricane rain math of 10 inches a day, a couple of days stall give us 20 to 30 inches. Stall for two more days and we see fifty inches. As an aside, the polar vortex is another part of this discussion that is related, that we hear about often in winter with blizzards. 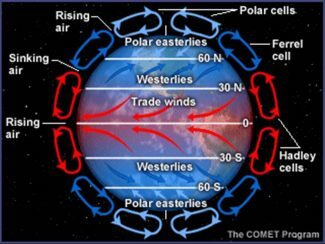 The polar vortex is simply a meandering, relatively tightly spinning area of air at the poles caused because our world is round and air flows around it because it spins. The polar vortex wanders around in the arctic like a spinning top wobbles, drunkenly and naturally. When Rossby waves slow, the polar vortex wobble increases, pulling polar air farther south as the wobbles meander southward with the increasing wobbliness. You can see the polar vortex wobbling about in the NASA video above. The strongest hurricane (by wind speed) ever to hit the U.S. at the time, creating the biggest storm surge ever recorded, was Camille in 1969 with a record 22 foot surge. It struck virtually the exact same spot as Katrina, but Katrina in 2005 had a surge of 28 feet. Hurricane Sandy’s record shattering impacts in 2012 were caused after Sandy had been downgraded to a tropical storm just before it made landfall. Not even a hurricane, it carried a storm surge of 14 feet, whereas a Category 1 hurricane has a normal storm surge of 4 to 5 feet (a Cat 2 is 6 to 8 feet, Cat 3 is 9 to 12, and a Cat 4 has a normal surge of 13 to 18 feet.) Ike, at Galveston in 2008, was a Cat 2 storm with a 22 foot storm surge. 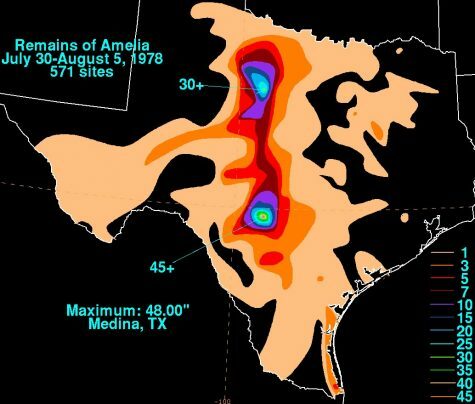 Four-foot rainfall events of note are rare, but two of them have happened in Texas; Amelia in 1978 and Claudette in 1979. Amelia had the all-time North American continent rainfall event record at 48 inches and Claudette had the all-time 24-hour rainfall record of 45 inches. Seeing as both of these storm happened in Texas, one might say Texas is a little bit prone to these events which would likely be a pretty valid statement. Enhancement of the stall is happening now because of two different things: Rossby waves and Hadley cells. Enhancement of rainfall quantity is happening in four different ways: increased moisture capacity, warmer ocean, deeper warming, and increased dynamics. If the enhancement was just a little bit, the answer to the question of “caused” or “enhanced” would not be so important. Another clue as to the responsibility of climate change lies in the extreme extent of the rains and this consideration is profound. Hurricanes stalls are not rare. Both the 24-hour and total event rainfall records in the U.S. were caused by stalled tropical systems. Hurricane Amelia and Tropical Storm Claudette created 24 inches of rainfall over an area in the mid hundreds of square miles each. 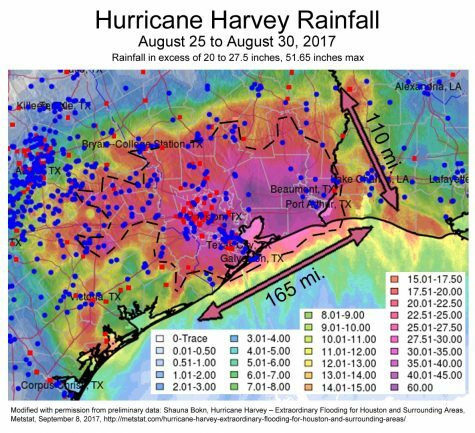 The vast difference with Harvey is that he created rainfall in excess of 24 inches in an area in of about 18,000 square miles. 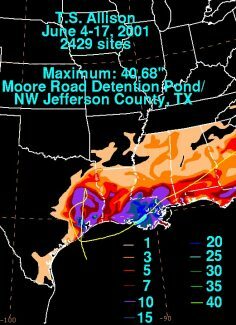 The area of 24 inch rainfall covered by Harvey was 36 to 45 times more than the previous all-time records. Was Harvey “enhanced” or “caused” by climate change? Ask a scientist and certainty compels them to say “enhanced.” But would Harvey have been such an incredible disaster if it had of not stalled, or stalled less? 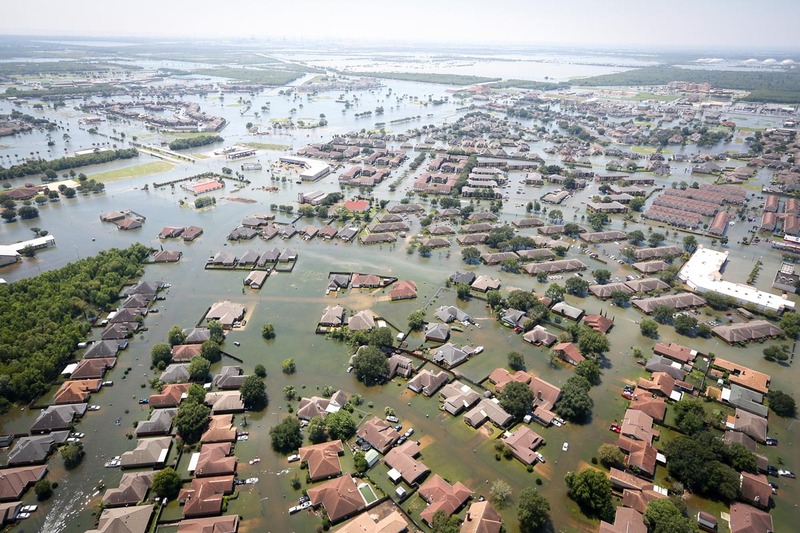 Did the climate change slowed Rossby waves and the expanded jelly roll Hadley Cells cause four feet of rain in Houston, when a normally hurricane would have created two, three, or even four days less rain? There is a distinct line between a weather catastrophe and just another weather event. Is it fair to say that climate change only “enhanced” this event when there is the distinct possibility that it would not have occurred at all without the stall, or the increased moisture in the warmer atmosphere, or the extra warm water, or the extra deep extra warm water, or the extra dynamics? It is the astonishing increase in area of massive rainfall that really holds Harvey apart from storms that were simply “enhanced” by climate change. How many more of these events will we have to endure before we begin to rightly call them as they are? If you ask climate scientist, or a media person or elected leader, or a plain old scientists who watches the news and listens to what the scientists say, we know what the answer will be. When are we going to begin using professional judgement to communicate the risk that current warming has already created to our society? That yes, current warming is very dangerous and we don’t have to wait for 1.5 or 2 degrees C of warming for it to become dangerous. When too, are we going to change our climate culture from one that only seeks to limit warming to some level that we see now is far too dangerous, rather than returning our climate to a safe and healthy state? Harvey was definitely “caused” by climate change. Without climate change, Harvey would have just been another 25 inch tropical system in Houston, And this supposition assumes that the stall would have happened anyway. Without the stall, because the storm hit 150 miles away, Houston could have been left high and dry with hardly a drop of rain. IPCC Technical Science Basis, Chapter 2 Observations: Atmosphere and Surface, 2.6 Changes in Extreme Events, 2.6.3 Tropical Storms, pg 217, paragraph 1. Reichler, Chapter 7, Changes in the Atmospheric Circulation as Indicator of Climate Change, in Letcher, Climate Change_Observed impacts on Planet Earth, The Netherlands, 2009, Elsevier, pp 45-164.